Highly Trained Obedient Bengal | A Cat Called Freya, and Teego Too! ← A New Cat Behaviour Film! you mind your Daddycat very well by giving him back his salmon. we did notice that Daddy cat did not eat the Salmon you gave back to him! Usually, when I give something back it is not quite that neat! Hilarious! My Mommeh is only sad she didn’t think of doing that first! Haha! Good job, Chatzi! You re-formed your Daddy’s salmon really well! Your Daddycat is quite the disciplinary dude… Between mancat to mancat – NEVER GIVE INTO YOUR DADDYCAT’S CRAZY REQUEST! MUST KEEP SALMON IN YOUR MOUTH! Chatzi, let me remind you AGAIN that you’re a mancat, and you’re supposed to do as you please. Repeat after me “MY DADDYCAT IS MY SLAVE”, one more time “MY DADDYCAT IS MY SLAVE”. A special thanks to your lovely sister for visiting. Please say hello to her from me. We have been very busy! P.S. 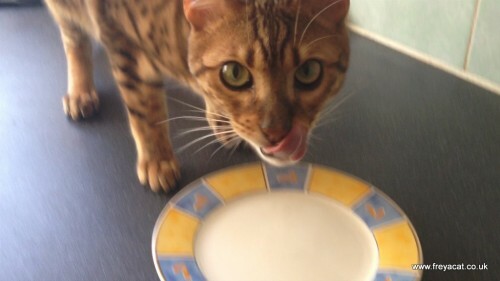 Nanny said that looking at your daddycat gorgeous eyes, she would give it (the salmon) back in a flash! We love the video! Very clever! Hey cats! Could you meow my story to your buddies ? I like that you are polite enough to give back the salmon. Me…I’m not that polite, although I may eat something and leave a little partially digested snack around for the lady to find. THANK YOU FOR YOUR WISHES. I hope you all had a nice holidays. … I hope you are all well. Tee Hee… I’m posting the first comment of 2013! Um, Chatzi, dude, you are showing us all up here.